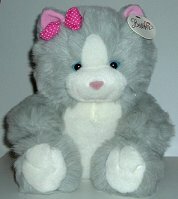 This plush cat with the bow in her hair is an armful of love. She is 12" high x 8 1/2" wide. Surface washable.